The Fugi apple tree is an excellent variety for home fruit production as it produces a large, crisp apple that is desired for eating fresh. Apple trees are not low-maintenance and require care to maintain fruit production for the 30-year lifespan. The trees are slow-growing and begin bearing fruit at six to 10 years of age. The Fugi apple tree produces an apple that has a yellow-green skin with an orange-red blush or stripes. The fruit is sweet, crisp and has a long refrigerator life. Fuji apples are heat-resistant and ripen for harvest in mid-September through October. This tree is a cloned species, which requires another species planted near as a pollinator. The Rome and Braeburn varieties are good cross-pollinator choices. Fuji apple trees are hardy to plant in USDA growing zones 5 through 8. The tree requires a location that has full sunlight through out the daylight hours and a nutrient-rich soil that is well-draining. Early morning sunlight is required as it will dry dew off the leaves to prevent disease. Contact your local university extension office to have a complete soil test conducted on the planting area soil. This will give recommendations for amendments needed to raise or lower the soil pH and fertilizer treatments best suited for apple trees. The Fuji apple tree requires irrigation during the growing and fruit production season. Apply at least one inch of water when the weekly rainfall amount is less than one inch during the spring and summer. Do not allow the tree to go more than three weeks without receiving water. Fertilize the tree based on the results of a complete soil test. The rule of thumb is to apply a 15-5-10 fertilizer each spring. Eliminate weed growth around the tree in the area below the limb spread. Use a hoe to dig the soil and manually pull the weeds from the soil. Prune Fugi apple trees during the dormant season in the late winter months of February and March. Remove dead and damaged branches and cut the tips of terminal branches by one-fourth the length. Prune internal branches that are crossing each other, making sure to maintain a central leader that is growing upright. Monitor apple trees for the presence of spider mites, aphids and coddling moth insects. 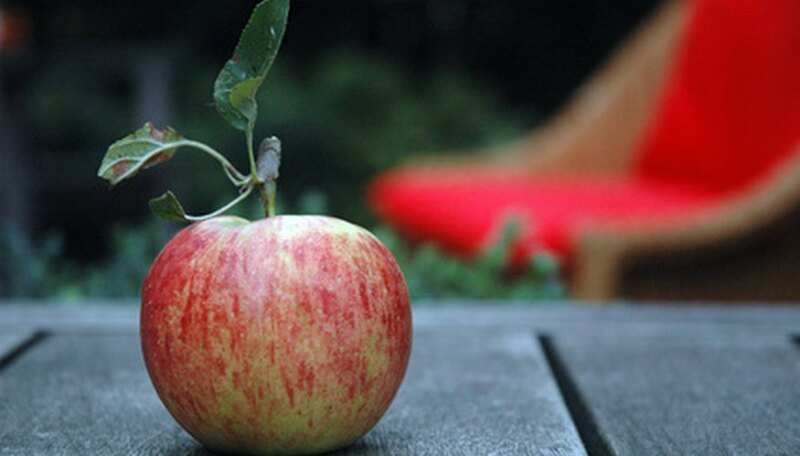 Apply a fruit tree insecticide to eliminate insects at the first sign of a problem. Apply horticultural oil once green growth is present to kill insect eggs that overwintered on the tree. Prune dead and diseased branches in late winter and remove fallen leaves, dried apples and other tree debris from the ground area. This will lower the risk of scab, rust and fireblight being introduced into the tree.